Sinclair Breweries Ltd is re-launching its Atlas Brewing Company range, it was announced this week. The initial brews have been created at the state-of-the-art, SALSA approved, Orkney Brewery, by a team that includes John Rodger, one of the original and pioneering Atlas brewers. The new line of Atlas beers will be packaged in 30-litre keg and 330ml can format, with a fresh, striking and innovative visual identity. Defined by a more intense New World hop character, the range has been prepared using renewed techniques and is aimed at the contemporary craft beer drinker. New recipes were brewed at the end of February, with three variants in cans – Atlas Latitude Pale, Wayfarer IPA and Nimbus Blonde – just packaged. 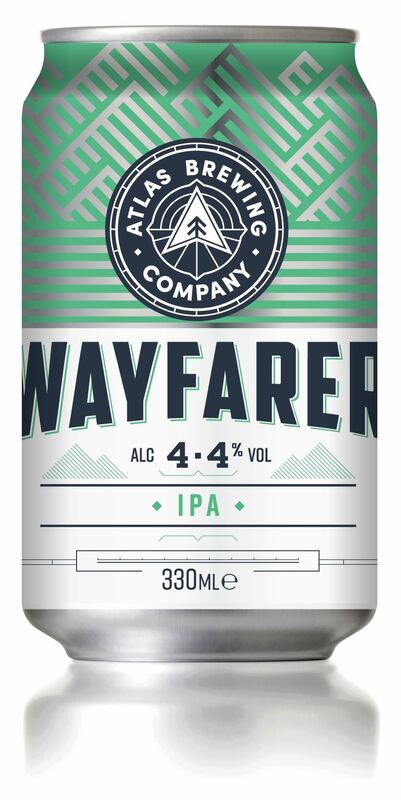 Wayfarer IPA will lead the way in draft, with Latitude Pale to follow in April. The new Atlas beers perfectly counterpoint the Orkney award-winning range of premium cask and bottle ale already supplied by Sinclair Breweries Ltd.
Craig Steven, Sinclair Breweries’ commercial manager, and Scotland’s first certified beer sommelier, said: “By re-launching Atlas we can push the New World flavours in the formats best suited, and be able to offer a more complete solution in our range of beers, without sacrificing the old-world character and premium that is the Orkney Brewery. “Beer drinkers these days like to jump between cask and keg, as well as from bottle to can. We happily recognise that people also like to drink classic authentic styles, as well as what people call ‘modern craft’. You don’t consistently disregard French wine for Californian.